Warnings: Slapstick comedy. Enjoy it or don’t. Sage’s Comments: Um… Uh… I’ve gotta lay off the caffeine. Modad’s Comments: Here’s part 2, more stuff happens and uh…yeah, what were we thinking? Razor watched in pure horror as the once anti-evil formerly non-possessed Callie Briggs snarled in a terrible rage, fueled by her hair’s own personal power. Like a blonde bull-whip, Callie’s hair shot across the remnants of City Hall with a snap of air breaking as it came dangerously close to Razor. Razor screamed, diving to a side. Looking around anxiously, he found a pair of scissors. “Back! Back you beast! Back!” he yelled, snipping away. “SCISSORS?” Possessed Callie replied. “THEY ARE NO MATCH FOR THE POWER OF THE HAIR SIDE!” she stated, and then with an unseen force the bull-whip quickly changed to a giant afro battering ram with Callie running full tile head first at Razor, decimating anything in her path. “Crud!” Razor leaped up to the ceiling, looking around desperately. “Gah!” a familiar voiced shouted from the same vantage point as Razor. “What are you doing up heeeere? This is MY hiding spot!” the disgruntled voice of Mayor Manx said as he nudged Razor with a nine-iron, causing the SWAT Kat to fall back to the floor. “Huh? !” Razor fell off the ceiling, back-flipping clumsily to the ground. “No!” T-Bone abruptly shouted, freezing both Callie and Razor mid-step. “No Apollo! I can’t let yoos go!” the larger SWAT Kat mumbled rather loudly in-between snores. “ADRIAN!!!! !” he abruptly yelled, and got up, waving his arms wildly in the air. “Uh, yeah, he’s a Rocky fan,” Razor stated. “The One Dollar Store was closed!” Razor wailed. Razor started to back away. “What was dat’ Mickey?” T-Bone called out, facing the wrong direction. “Didja say hit em’ witha sway?” the larger SWAT Kat asked as he began to move in a more fluidic manner. “The other way! Th oth…” No more were the words of the SWAT Kat Razor as he nailed the floor with a hard thunk. “Owie…” Razor managed to murmur. “Who? Callie? Okay!” T-Bone started to stumble towards the she-kat. “FEAR ME MORTAL, FOR I WILL DESTROY YOU WITH MY INVINCIBLE HAIR POWER!” Callie shouted, her eyes glowing a deep crimson. Abruptly her hair shot out, slamming T-Bone in the face. Stumbling back for a second the still unconscious T-Bone regained his composure. “Cowwie, you hit like a gurl!” T-Bone stated, as he began to block the hair shots as the two engaged in a “boxing” match. “A COW?! ARE YOU CALLING ME… FAT?!?!??!?!?!?!!?!! ?” Callie screamed, as she dove for T-Bone once again. “Oof!” T-Bone exclaimed as he was tackled. “Whoa there, you’ve really been packin’ dem donuts,” T-Bone commented. Callie’s hair went for a frontal attack. “Uh! Ooo! Huack!” T-Bone shouted out many times as the hair attacked with a lethal fury, jabbing out in numerous points delivering lefts and rights and middles and sides into the SWAT Kat. “MWAHAHAHA!” Callie laughed as her hair began to decimate the large tabby. “No! It can’t end like this, what would Mickey say?” T-Bone’s inner monologue began. “What are ya sayin’, Mickey?” T-Bone asked. T-Bone’s eyes lit up with a new found determination. Abruptly the theme from “Rocky” began to play in the background. “WHERE THE HECK DID THAT MUSIC COME FROM?” Callie asked. With that, T-Bone went for a right hand jab, another one dodging the evil hair, another dodging the light beams from Callie’s glasses. “I will not give up!” T-Bone shouted. Callie’s eyes lit up in horror as what appeared to be a super slow motion effect came into effect. T-Bone decked Callie squarely in the jaw, her head turning to the side. He just as quickly came back with a left, and sent Callie’s head turning the other direction. “Thhhhhiiiiiiiisssss iiiiiiiisssss fooooooor Apoooooooooolloooooooo!” T-Bone shouted, in super slow motion. “Noooooooooooooo Teeeeeeeeeeeeee-Boooooooooooone!” Razor shouted from his vantage point, but too late. At that moment T-Bone quickly awoke from his “sleep boxing” to see the carnage laid before him. “Whoa, um… let’s get out of here,” he said quickly. T-Bone pondered for a second what he would do, when Mayor Manx walked into the room making his usual unintelligible noises. “Hum dee dum dee, Huwhaaaat?” he shouted, his toupee jumping form his head briefly. “My office!” he shouted, then looked at Callie. “My Deputy Mayor!” he nearly screamed. “Ah-ha! I got an idea!” T-Bone exclaimed, and decked Mayor Manx square in the jaw. The Mayor fell to the floor with a wheezing sound similar to that of deflating bag-pipes. He then quickly took off his boxing gloves, put them on Mayor Manx and propped him up near Callie. “You got a better idea?” T-Bone demanded. Meanwhile, back at Megakat Telecommunications, the Pastmaster tapped his foot impatiently. Sitting at one of the many desks he snarled in rage as he was defeated in another game of solitaire. “Argh!” the Pastmaster shouted in anger, as he aimed his watch and fired a red beam of energy, destroying the entire computer. “Um, would you mind not doing that? That’s the 15th computer you’ve done that too,” one of the Techs said over a dozen smoking remains seen behind him. The technician sighed and sank amongst the broken computers. This was going to be a long night. Back in the skies of Megakat City our two beloved heroes were once again doing their SWAT Katty job of justice. “So, what were we supposed to do again?” T-Bone asked. 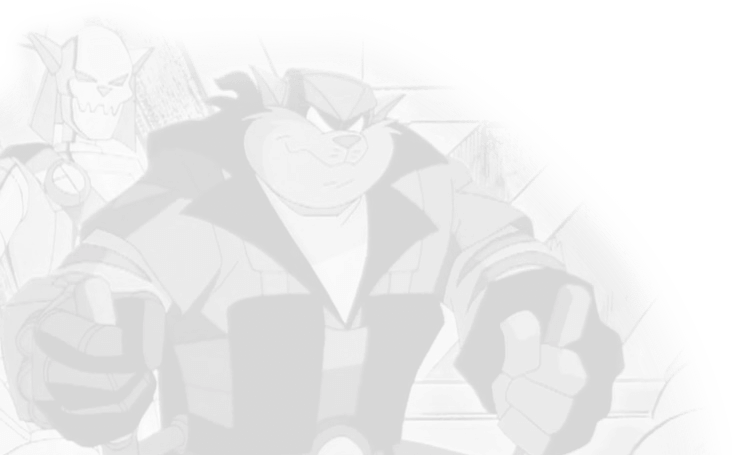 Razor sighed, fearful of what would result from both Callie being KO’d by T-Bone and the SWAT Kats framing Mayor Manx. Not to mention the Deputy Mayor’s looks being forever destroyed. “Hrm, maybe if I come up with a make-up missile she’ll forgive us,” Razor pondered. “Hey, you’re the one who wanted me to make a missile that changes the channels on the TV, but *you* said it needed more power, and look what happened,” Razor reminded. “DID-Ahhh!!! Watch out for that building!” Razor warned. Abruptly the phone rang, interrupting the two. “Whoops, forgot to turn off my cell,” T-Bone stated as he reached into his jumpsuit pocket and withdrew a cellular phone. 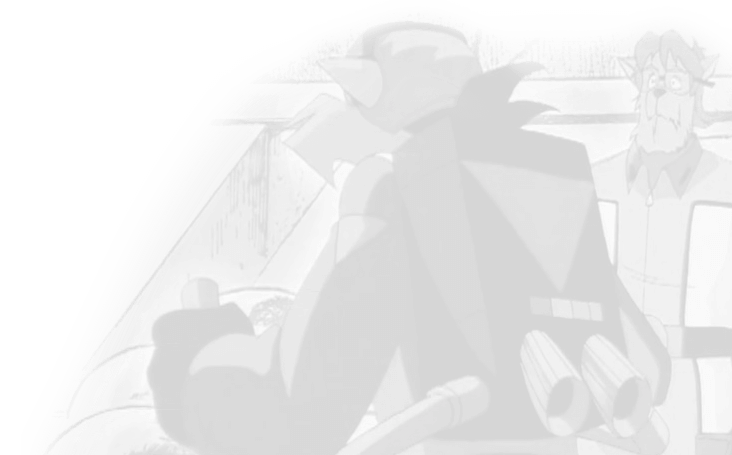 “Yeah there is, because my SWAT Kat Law Breaker Tracker just jumped up another point, making it 25235522 now,” Razor stated as he pulled up a digital display on his consul. “Argh!” T-Bone shouted, and turned around, ripping out a component in Razor’s consul. “That’s destruction of property… and you destroyed the wrong device,” Razor resumed his arms folded position. “Crud!” T-Bone exclaimed, slamming his fist down, and breaking something else. “Will you SHUT UP!” T-Bone yelled, slamming his fist again. “Ah CRUD!” T-Bone shouted, and punched the control box, trying to get it to work again. Abruptly both wings fell off the Turbokat. Razor sighed as he pressed a button on his control panel, causing a giant rubber ducky to inflate under the jet as it landed softly in front of Enforcer Headquarters. T-Bone blinked, and turned to glaaaaaaare at Razor. “You said a line like that too!” Razor hastily pointed out. “DID TOO!” Razor began, but then paused as there was a knock on the canopy. The source of the knock was coming from Commander Feral. “Now you having him laughing at us! WE’RE supposed to do that!” T-Bone cried, pointing out the canopy. Just as soon nearly all of the Enforcers poked their heads out the windows of HQ, and began pointing and laughing. “I got an idea for a quick escape!” Razor stated, and opened the canopy, leaning outside. He extended one of his claws and poked a hole in the rubber ducky, causing it to pop and send the jet rocketing forward. It just as abruptly sent T-Bone and Razor flying out of their seats and landing on their rear ends outside as their trademark jet zoomed around in the sky for a few seconds then crashed into the Enforcer HQ tower. “OOPS? !” T-Bone cried yet again. “I think your tracker just got you a few points for that one,” T-Bone said smugly. Razor only glowered in return. Much later, both SWAT Kats found themselves in a holding cell.